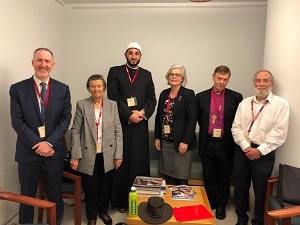 On Thursday morning 18 October a delegation of six faith leaders met with both the Minister for Immigration David Coleman and the Shadow Minister Shayne Neumann. They spoke to the Ministers of the desperation of the people on Nauru and Manus Island and the work that faith-based groups do with these people. The NCCA President, Bishop Philip Huggins and NCCA Interim General Secretary, Liz Stone will be part of this delegation speaking out for the children still detained on Nauru. The group of faith leaders advocated for a bi-partisan approach to support a plan to restore hope and dignity to those on Manus and Nauru, in the hope of bringing children and their families from Nauru to Australia. “Our shared priority must be to remove the children and their families from the harm of indefinite offshore detention and give them hope and protection through appropriate support services that are available in Australia and New Zealand. Five years is too long” said Bishop Philip Huggins,on behalf of the multi-faith group. Download the attached 19 October Media Releaseto read. Yesterday, aware of heightened community concerns about the plight of asylum seeker children on Nauru and a growing sense that five years is just too long for people to be held on off-shore islands, Bishop Philip Huggins, Rabbi Shamir Caplan, Imam Alaa Elzokm, Elizabeth Stone, Harold Zwier and I set off to Canberra to meet with David Coleman, the Minister for Immigration and Shayne Neumann the Shadow Minister. Conscious of the desperation of the people on Nauru and Manus Island, aware of the calls from the AMA, the NGOs and judicial organisations and the work done by faith-based groups we knew how important it was to offer the Ministers our insights into finding a solution. 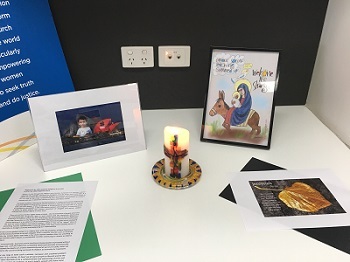 As a support for our endeavours I called on all the Loreto Sisters’ communities and ministries across Australia to light a candle, say a prayer or pause for a moment at 11 am when we were meeting with the Minister. The Loreto Province Office brought the staff together around the prayer centre (see photo, right), Loreto Normanhurst school sounded the gong at 11 for students and staff to pray and I received many messages from Sisters and colleagues assuring us of their prayers. The Ministers listened and we listened to them – there was, unfortunately, no perceived change in their policies on off-shore processing but they were softening in their attitudes to the children on Nauru. Both were committed to settling the refugees and asylum seekers in countries, other than Australia, but there was little detail into how this might be achieved. The most positive aspect of the day was the coming together of people of different faiths committed to working together, united by much more than the things that divide us and convinced that we have to keep working for a humane, compassionate and decent refugee policy. Australia can be so much better.